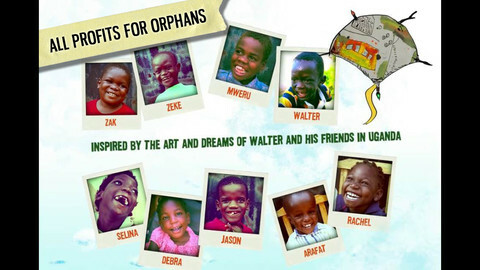 Walter’s Flying Bus is packed with mini-documentaries about real-life kids, each of whom is an orphan with some sort of disfiguration or disability. 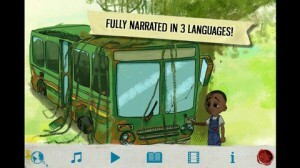 It’s stirring, moving stuff, and Walter’s Flying Bus is utterly unlike anything else on the App Store today. Please note: to hear these stories, you will need to have an active Wi-Fi connection. There are interactive, animated adventures to enjoy, and all content is rated as appropriate for users aged 4 and up. The main art is inspired by the artwork of Walter, a real Ugandan orphan featured in the app. On top of obvious international appeal, Walter’s Flying Bus is ideal for kids who are practicing a second language, or for kids who are bilingual. 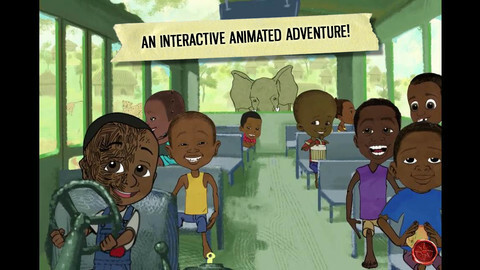 Narrated in English, Spanish and Luganda, this app casts a wide net. 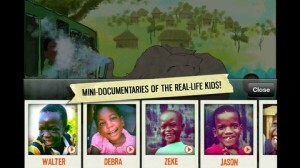 With original music and true life stories, Walter’s Flying Bus is a must-see app. If you have a single compassionate bone in your body, you need to download this app. These stories will stick with you. If you tend towards bouts of “app remorse” after buying a ton of cheap apps, rest assured: Walter’s Fly Bus is an app you’ll feel good about downloading. Walter’s Flying Busis compatible with iPhone 3GS, iPhone 4, iPhone 4S, iPhone 5, iPod touch (3rd generation), iPod touch (4th generation), iPod touch (5th generation) and iPad. Requires iOS 5.0 or later. This app is optimized for iPhone 5.